Inhale. Hold the pose. Pay no attention to the fact that the room is sweltering, that the air seems to cling to your nose and mouth like a mask of sodden mesh. Exhale. Ignore the sweat pouring from your body and pooling on the hardwood floor, soaking your yoga mat to the consistency of a lily pad. The heat is on at Yoga Flow in Aspinwall, where a dozen men and women bend, balance and drip through a vinyasa flow class taught by owner Dominique Ponko. Not only is the furnace running, but two humidifiers are pumping moisture into the air. "Sweep your arms to the sky," she says. "Exhale, swan dive, inhale halfway, lift. Exhale, Chatturanga." This practice is known generically as hot yoga. In a new twist on the ancient Eastern discipline, hot yoga practitioners perform traditional poses in a room heated to 90 degrees or more. Hot yoga has been getting a wringing wet endorsement from enthusiasts who say that it relieves stress, drops pounds and increases flexibility, balance and strength. Having the room temperature approximate the body's own temperature warms muscles and helps prevent injury, advocates say. Ponko, who owns the studio with husband Mark, says her regulars include football players and an auto mechanic. Today's class comprises both men and women, from a woman in her 70s to a 12-year-old boy. It's not always easy. An attempt by a sweat-drenched reporter to assume the "crow" position falls flat, as does the reporter. But it's OK -- everyone goes at their own pace. "You're not a sissy if you take a rest," Ponko says. "It's like learning to let go. Yoga is a totally different mindset. It's like letting go of that competitiveness." Most say the heat is the toughest hurdle to conquer. Julie Podgorski, 33, of Lawenceville says she felt intimidated at first but soon relaxed when she realized that nobody was judging her. She's been attending classes for eight months. She says hot yoga has helped her to lose weight and firm her triceps. "I've noticed the difference," she says. "You use a lot of arms. You're lifting your own body weight." Steve Swantner, 55, of Plum has run 14 marathons. He runs less these days but divides his time between weight lifting and hot yoga three times a week. 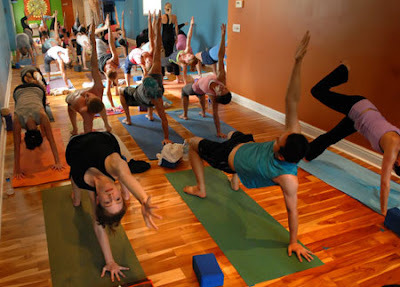 He started at Yoga Flow's Murrysville studio. "I heard so much about it," he says. "I had no idea what it was like, exercise or meditation. You kind of learn to breathe your way through the discomfort. I like how it opens up my body. ... When you're running a marathon you hit those rough parts. You learn to breathe through it, just let the discomfort be there." He says the yoga regimen has him at his lowest weight as an adult. One form of hot yoga is Birkram Yoga, which was devised and trademarked by Indian yoga master Bikram Choudhury. It entails performing 26 traditional yoga poses in a room heated to over 100 degrees. Today there are more than 300 certified Bikram studios across the country. Unlike some other studios, bailing early from a class is frowned upon in Bikram yoga. But Genalle Passanante, owner of Bikram Yoga Pittsburgh in the Strip District, says the rule is often misinterpreted. "We don't necessarily lock the door," she says. "We do try to encourage everyone to stay through the whole class. Every student who comes on the first day, we tell them 'Your only goal for that first day is just to stay in the room.' It's a mental challenge. A lot of times you might think you need to leave the room. Usually, when you stay through the class you're pretty thankful." Studio owners say they've never had anyone pass out in a Birkram or other hot yoga class, although some have gotten woozy because they haven't eaten enough. "We've had students who have gone off of blood pressure medication, who have gone off thyroid medication, reversed their diabetes," Passanante says. "Regular practice can really help." One oft-stated claim that the profuse perspiration of hot yoga helps to sweat toxins from the body is untrue, says Tanya Hagen, assistant professor of orthopedics in sports medicine at UPMC Sports. "The purpose of sweating is not to get rid of toxins," she says. "That's the job of the kidneys and the liver." A person engaged in strenuous activity can sweat out as much as one liter of fluid an hour, she says. Staying hydrated during hot yoga is important. "For anyone who has any cardiovascular or kidney problems, any history of heat illness, it may not be the preferred choice for exercise," Hagen says. 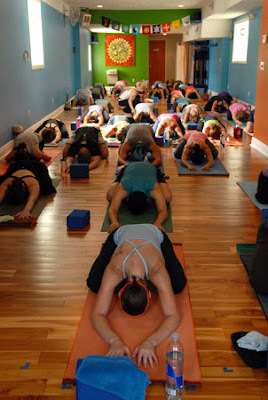 Amazing Yoga teaches hot yoga in their Shadyside, South Side and Franklin Park studios. Sean Conley, who owns the studios with his wife, Karen, says that Pittsburgh is late for the hot yoga trend, but that it's making up for lost time. He says they teach a total of 26 hot yoga classes a week at their three studios. "This summer here was, without a doubt, our busiest summer," he says. "Even with the economy, our classes at all three studios have been at the highest attendance ever." The first rule of yoga: don't be afraid. That goes for hot yoga, where poses are performed in a heated room. If you're thinking of trying hot yoga, consider taking a beginner's class. Most studios offer them. Julie Podgorski of Lawrenceville wasn't sure she could strike complicated poses like the "airplane" or "the wheel." But she overcame her fears and is now a regular at Yoga Flow in Aspinwall. "It's not about getting it right," she says. "It's about being present." • Be on time. Some yoga studios are strict about punctuality. Others don't mind if someone comes late. They also may not mind someone leaving class early because they can't stand the heat. However, some studios, such as those that teach Bikram yoga, usually require students to stay for the duration, so ask beforehand. • Bring plenty of water. Stay hydrated. • Bring an extra change of clothes. You will be drenched. • Don't use your cell phone. And no texting. • Don't slam doors or chat with your neighbor during class. Leave the iPod at home. • Practice good hygiene. Taking a shower before you come to class doesn't hurt. Avoid heavy perfumes or cologne. • Remember that it's not a competition. If you can't hold a pose or you stumble, laugh it off.